With everything that has happened over the last couple of months, players are understandably curious and concerned about of the future of Daybreak Games’ portfolio. What will happen with their favorite games? Today we sat down with Holly Longdale, the executive producer of EverQuest and EverQuest II, who unveiled the plans for EQII going forward. And those plans involve dropping the yearly expansion model and converting to DLC. How soon is this change taking place? The first DLC, Rum Cellar, will be available on the beta server this Monday, April 6th, and release to live servers on April 28th. Players who want to get a peek at this content will be treated to a livestream tour hosted by Longdale on Tuesday, April 7th. But for those who don’t want to wait, we’ve got plenty of information for you right here. Those who have been wondering about the future of EQII development finally have an answer. Longdale explained, “As we go forward, we are looking at a DLC-type mentality and philosophy.” Called campaigns, these DLCs will replace yearly expansions, and Longdale emphasized that they will add up to the same amount of content that would normally be put out in yearly expansion, but Daybreak is planning to “package it up in a variety of ways over the year.” These changes, she said, were implemented in accordance with player feedback. Longdale also explained some of the benefits of doing DLCs, such as greater flexibility and the ability to give players what they want when they want it. As for flexibility, the campaigns will allow the team to provide various bundles aimed at different groups of players, pretty much like separating the Age of Discovery expansion into its components. This way players aren’t purchasing parts of the game they don’t personally want — for example, there might be a pack with items a decorator would want but raiders wouldn’t really care about. On top of that, there’s also the chance to make bundles of packs and offer discounts for the purchase of more than one at a time — a real benefit to players and families with multiple accounts. Getting players their desired content in a timely manner is also more feasible with these campaign packs, Longdale argued. No matter how excited a community is for content in an upcoming expansion, the long wait could mean that interests and wants have moved on by the time it finally comes out. Longdale believes that the campaign model will be more responsive to the community’s desires. “We want to be able to react more quickly to the community, ” she said. Another difference between the campaigns and the yearly expansion models is obviously the prices. But will campaigns really be better for players overall? Rum cellar, the debut campaign, will cost players $15; future campaigns will have varying costs depending on what is included. Longdale has revealed that the fall campaign, which will be larger in comparison, will have a larger price tag. So depending on how much content is released, a player who gets everything a la carte could conceivably spend more than just the one-time expansion cost. However, players who forego any part of the content they aren’t interested in will conceivably see some kind of savings. All-Access members will receive their customary discount on all campaign packs — and please note that campaigns can be purchased only with actual money, not Station Cash. One casualty to this new release system is the free content updates of the previous year. Longdale said that the game upgrades, such as the class changes that are currently in beta and the cross-server dungeon finder that is slated to come out in August), as well as all holiday events will continue to be free to all players. Content, however, will be a packaged into the campaigns. First and foremost, this first downloadable content pack is aimed at level 100 adventurers and is accessed from the Phantom Sea, an Altar of Malice zone (so yes, you do need the latest expansion to play it). Longdale emphasized that those who want to purchase the DLC but do not have the expansion will actually receive a deal on the two bundled together, though the exact prices of the deal have not yet been decided. None of the zones is required in order to do the others, but the story itself is woven throughout each consecutive version. That means that players who do not participate in the raid portion of Rum Cellar will actually miss out on some of the campaign story. Longdale said that folks will get the essence of the story in the heroics zone, and some details are unique to the raid content, including two unique boss characters (and some dude who beats you with a dismembered arm!). 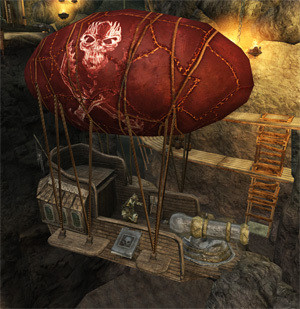 Addressing concerns that the content pack would be blown through quickly, Longdale said that the Rum Cellar has quite a bit of replayability. She noted that the solo zone has hidden things for players to discover and that the raid zone has nine different events in it as well as a one-shot boss. And while the heroic zone could take players 30 minutes to an hour to complete (depending on skills), each run awards players special coins to spend at the Rum Cellar merchant. New zones always bring new loot, and Rum Cellar is no exception. A special merchant will be stationed inside to offer loot exclusive to this zone, such as a giant blue blimp mount that sports a pirate ship base (cannon included!). Additionally, there is plenty of new loot to be had as drops, including a different rare version of the blimp-mobile with stats as well as a Drunken Monk elite mercenary. Remember the aforementioned dismembered arm that you can be beaten with? That is also available to players in this content. Of course, there are new collectable items and new achievements as you’d also expect to find in new content. So what’s in the forecast for EQII? Longdale said progression is still very important but that for the immediate future players will be remaining at level 100; progression will be spread out laterally instead. This lateral movement includes this fall’s upcoming revision to the deity system, which will offer players even more abilities on top of the Alternate Advancement system. With the loss of SOE Live, we also asked about any plans involving this summer’s Fan Faire that is currently being put together. The team is definitely supportive, and it is anticipated that some staff members will be attendees to the event. Next articleThe Daily Grind: What’s the last non-combat activity you did in an MMO? I recall when the adventure packs went in. LFG for Bloodlines. If you didn’t have the DLC, nevermind. Raid scheduled but you haven’t paid the $5 on top of your subscription? Too bad. Obstacles to groups is exactly what an MMO with anemic populations on most servers needs. God the love and hate SoE has created over the years. agemyth Denice J Cook Norlamin Lets be real.. they cut key (critical) people (especially in the new games coming) in spots you dont just shuffle around in the middle of development. Something will happen…or not rather. They probably think atm it costs to much to develop. SoE was in serious trouble. With that said I was assuming they would go into nickle n dime’n the old stuff and completly focus on the new stuff. They hype being worth it to them to purchase.. But I dunno.. So far they have showed they dont know w t h they are doing. Even repeating things SoE did LOL. As in things that damaged them. Its like They think just because they are new people will fall for it? Shermanx ..right but you still had access as subs, and you had xpacks to look forward to lol. Aywren Thing is the last ones were sorta small lol. Sooo say splitting something like that up would tech be even smaller. And you will lose your playerbases interest even faster the ever before..
People have no issue waiting around for packs; its a big deal to most fans. This is like a trail of peanuts that last for 5 seconds tho. No one will wait around. Waiting for an xpack is part of the fuel needed to keep going love of the game will only take you so far. This content will be consumed in a day if not days; and have zero replay unless they somehow force a grind out of it. Elenire paid for on top of paying for sub if you are one lol..
dirtyklingon not really.. At least until the last 2 or AoM at least. Grimfargo Wow so you cant use SC as a Sub. Sorry they are nickle n dime’n us now then. We have been here before.. So they think because they are new suddenly all is forgotten? The standard out there is Subs dont pay for DLC.. At he very least they get it WHILE subbed. Even then those games still promise xpacks and free content lol. This is bull… A Dscount of like what $1-2? Lol. I will love you forever Eq2!!! RiP. I will probably be something most will do in a day if not days lol. Then you’re board faster then ever before. I hope they at least continue the old pace of dropping content throughout the year w/o nickle and dime’n you. Otherwise what is the point of being a sub anymore..
As realistic as this sounds because of the business sound; it comes across as crock for me; none of it it for our benefit. I really does mean less for more imo.